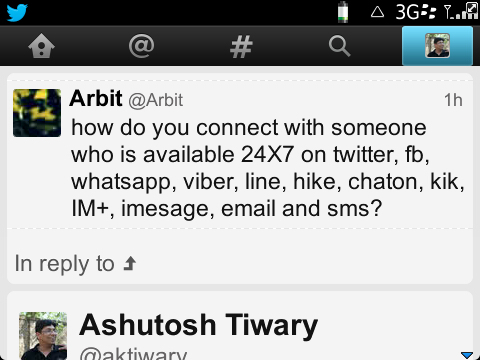 Some 15 minutes back (May be 20) my friend on Twitter Saurabh (@arbit) tweeted about connecting with an “always on” friend. Actually, think about it, there is someone you know who is in your phonebook, Facebook, Twitter, WhatsApp and what not. How do you connect with that person? Let’s assume, s/he is not a childhood friend and not your boss. What I mean is, there is that “little” formality in the relation. Of course, if you are calling, nothing else matters. You are not calling and it’s just, ainwayi. My preferred mode of communication in that case would be Twitter. It’s not too direct, not too intrusive. You are just nudging someone (who is ready to be nudged) in the most gentle fashion. Twitter to be the conversation starter and then take it to the medium depending on where the talk leads. What would you do in that scenario? This entry was posted in Musings on technology. Bookmark the permalink.